Now that you understand what the milky way actually is, the next step is finding yourself a sky dark enough to see it. Where Can You See the Milky Way? You can see the milky way from anywhere, provided you have the necessary dark sky conditions. That part is very important, as visibility of the milky way is easily washed out by things like moonlight, pre-dawn or post-dusk sunlight, or light from nearby cities (called Light Pollution). For instance, barring a city-wide blackout, you’re not going to be able to see the milky way from Los Angeles. Nice dark, moonless skies away from light pollution will get you a nire colorful, more contrasty milky way. The first step to being able to see the milky way is to get somewhere without too much light pollution. Thankfully, there are some great resources out there for this. A free favorite of mine is Dark Sky Finder. Sky darkness is measured via something called the Bortle Scale. DarkSiteFinder allows you to zoom around on a map of the world with the amount of light pollution overlaid on each spot in the map, with colors representing different ratings on the bortle scale. Light pollution map of the USA. Note how much darker the skies are out west. Generally, if you’re anywhere white or red on the map, you’re not going to be able to see the milky way. Later in this series we’ll talk about some tricks for photographing the milky way in these conditions, but even then it is going to be very washed out. For now let’s assume that yellow/orange are the absolute minimum darkness levels to see the milky way, and even in those cases you need to be sure that the milky way is on the opposite side of the sky of the brighter red/white areas. That is, if you’re in a yellow zone and the milky way is in the eastern sky, the area to the east of you needs to be relatively clear. If you’re on the west side of a city in a yellow zone (and hence the area to your east is a red or white area) when the milky way is in the eastern sky, you won’t see it. Above is a straight out of camera comparison of a bortle class 2 (grey) zone in Canyonlands National Park on the left, versus a bortle class 5 (yellow) zone in Eden, UT. With some post processing we’ll be able to get a decently defined milky way out of the bortle class 5 image, but we’ll never be able to get it anywhere near what we can do with that shot from Canyonlands in a class 2 dark sky. Also take note of how much more color there is in not only the milky way itself, but also the stars in the image on the left. Again, with some processing we can really bring that color out. 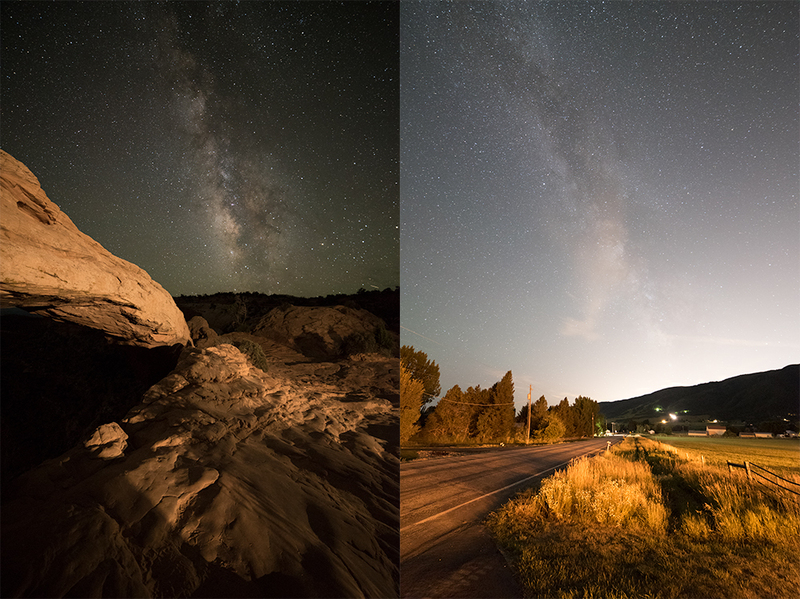 In the image on the right, we’re pretty much stuck with white stars because all of the color is washed out by light pollution. Note that the image on the right is not merely hamstrung by being in a yellow zone, but also by the fact that in that case I was shooting south, and about 50 miles to the south lies Salt Lake City, a white/red zone. This goes back to my earlier point that it’s not just the bortle class sky that we’re standing in while we shoot, but also the bortle class of the sky we’re shooting towards when we shoot. 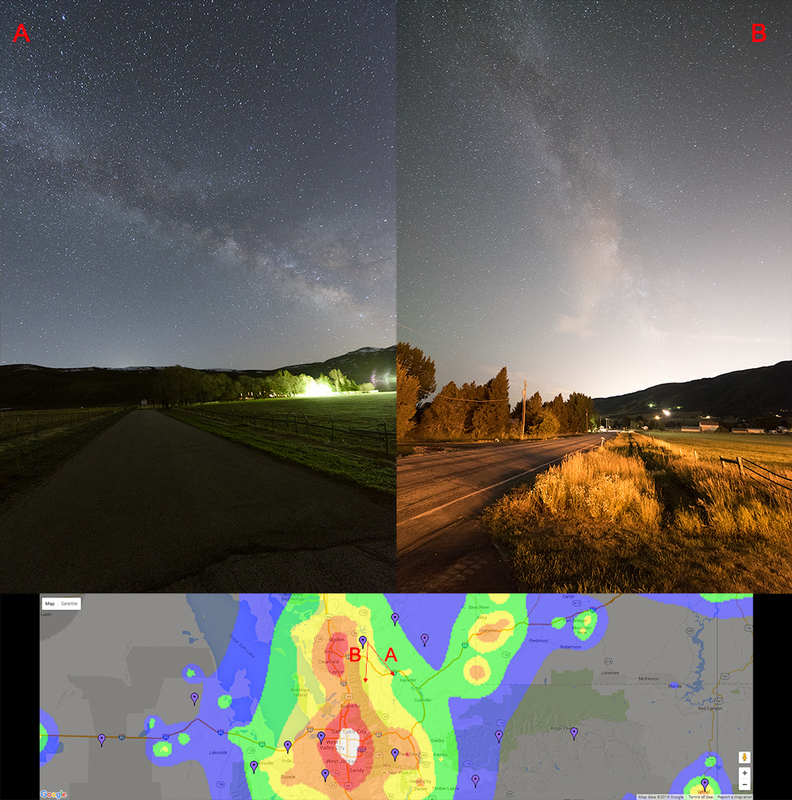 Here is another comparison shot, this time with our familiar image on the right, but also another shot from just down the road taken in a time of the year when the milky way was in the eastern sky rather than the southern sky. As you can see from our dark sky finder map (you may need to click on the image to make it larger), even though we were still in a yellow zone for that shot, we were looking towards a darker zone in shot A and, more importantly, were not pointed towards any big cities. Note how much better you can see the MW core, which is not very high above the horizon, in shot A when I was pointed towards darker skies even though my shooting locations were only a mile or so apart. We’re still a long ways off from our Bortle Class 2 image up above, but it is a marked improvement. While we’ll get into some creative uses of moonlight later, in general moonlight is a bad thing when trying to shoot the milky way. The moon is actually quite bright, and the light from a large moon will wash out the milky way entirely. Fortunately, each month generally has one new moon where there is no light reflected on the moon. Typically, that night and each of the 4 nights surrounding it on either side (4 days before, 4 days after) the moon is dark enough that it won’t really affect milky way visibility. That gives you 9 nights each month with dark enough skies for milky way shooting. We can usually extend that out a few nights in each direction by paying careful attention to the times at which the moon rises and sets. Often, even a few days outside of those 9 ideal nights, we still have a period of the night where the milky way is already up and the moon either has not yet risen, or has already set. We will get into more detail about how to find these periods in the next article. 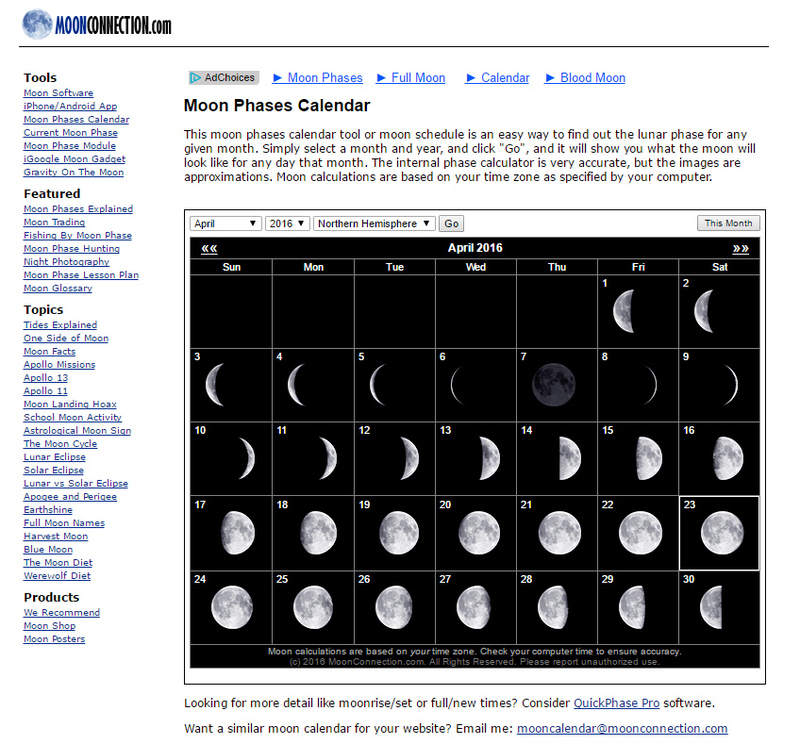 A great free resource for moon phases is the free Moon Connection website. In the image above, representing April of 2016, there is a new moon on April 7th. With our plus/minus 4 day rule, that means we should have plenty of darkness to see/shoot the milky way from April 4th – April 11th. We’ll likely be able to extend that out a few days in each direction by looking at moonrise/moonset times, which we will get to later when we start talking about what time the milky way itself is in the sky. If the moon is bright, then the sun is really, really bright. So much so that, unlike the moon, we actually still need to worry about sunlight even when the sun is well below the horizon. The general rule is that the sun will stop having an effect on your dark skies two hours after sunset, and will start ruining your dark skies two hours prior to sunrise. That’s right, even though it may look pretty dark out, the sun is still leaking enough light into your position to wash out your view of the milky way to some extent for a full two hours after it has disappeared from the horizon. More specifically, there are three time periods defined after the sun has set before you get completely dark skies. 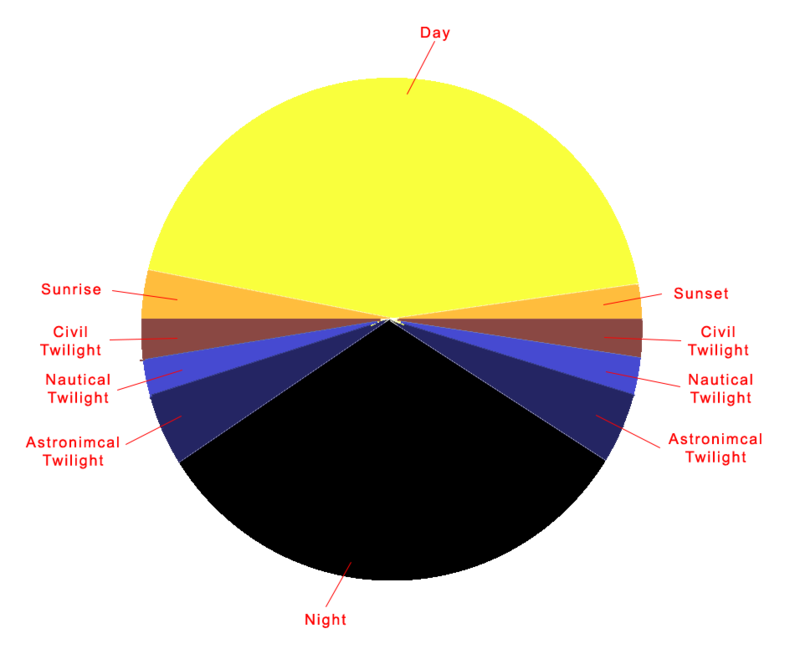 Civil Twilight – This encompasses the time when the sun is less than 6 degrees below the horizon. That is, the time soon after the sun has set or just before the sun rises. It is still pretty bright out during civil twilight. Nautical Twilight – The next step, when the sun is between 6 degrees and 12 degrees below the horizon. At this point you’ll start seeing a few of the brightest stars/planets in the sky, but it is still quite dark and the sky still has a blue color to it. Astronomical Twilight – The final step before we get totally dark skies, when the sun is between 12 degrees and 18 degrees below the horizon. To your eyes, it may look like fully dark night at this point. 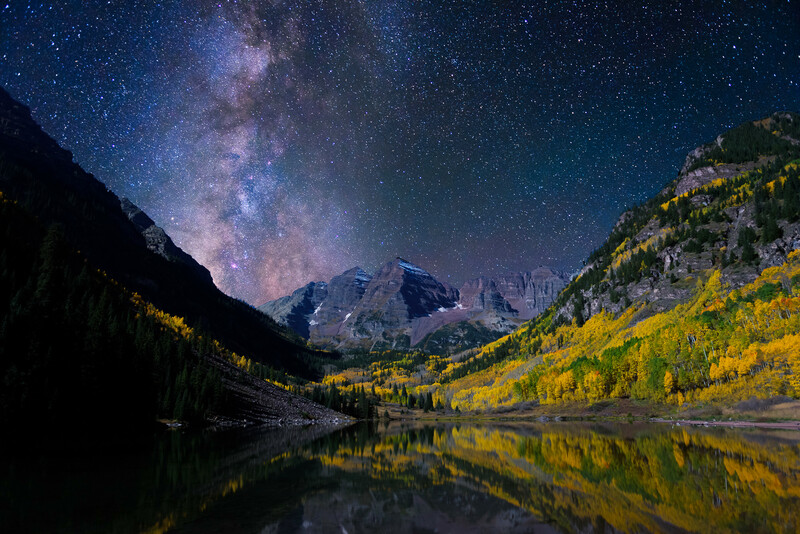 However, your camera will still be affected by the light from the sun and while you may be able to capture photos of the milky way during this period (depending on how well you’ve done in the areas of light pollution and moonlight), it will be somewhat washed out, lacking the color and contrast you would see in totally dark skies. After that (or before that if we’re talking about sunrise), when the sun is more than 18 degrees below the horizon, you will have your totally dark skies without any affect from sunlight. A not at all to scale free-hand day/night cycle. We are interested specifically in the area labeled “night”. Any other time is going to wash out the milky way to some extent, or totally. Before we get too deep into pinpointing it’s exact location, let’s review some generalities. All of the following assumes that you’re located in the northern hemisphere. If you’re located in the southern hemisphere, just add 6 months to every thing (for instance if I say July, for someone in the southern hemisphere it would occur in January instead). Generally speaking, the Milky Way will be visible to people in the northern hemisphere from March until early October.